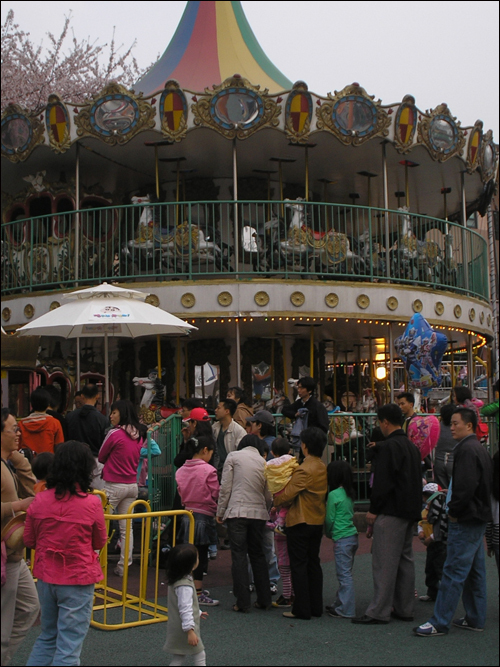 Waiting in line to ride the Merry-go-round. If you ask a Korean first or second grader what important event took place on June 25 they most likely won't be able to tell you, but ask them what holiday takes place on May 5 and nearly every one of them will answer Children's Day. Children's Day in Korea is viewed by Korean children in a similar manner as Christmas is viewed by many children in the rest of the world -- as a time for gifts and fun. Because it is a national holiday, parents are free to indulge the whims and wants of their offspring by taking them to amusement parks, movies, parks, zoos, and other places that draw the excited laughter of youth. Children playing in the water. According to various Internet sources, Children's Day in Korea was known as Boy's Day up until 1975 when it was officially accepted as a holiday, but, as seen below, there are other sources from the 1950s that clearly denote the day as "Children's Day." Perhaps the sources are confused with the Japanese holiday, on the same date, known as "Tango No Sekko" (Boy's Day). On this day a carp-shaped kite is displayed for each boy in a household. Considering Korea was under Japanese control at the time, it is very likely that this holiday was celebrated in Korea and that Bang Jeong-hwan, aware of the prejudices against little girls, declared it "Children's Day" to honor both sexes. 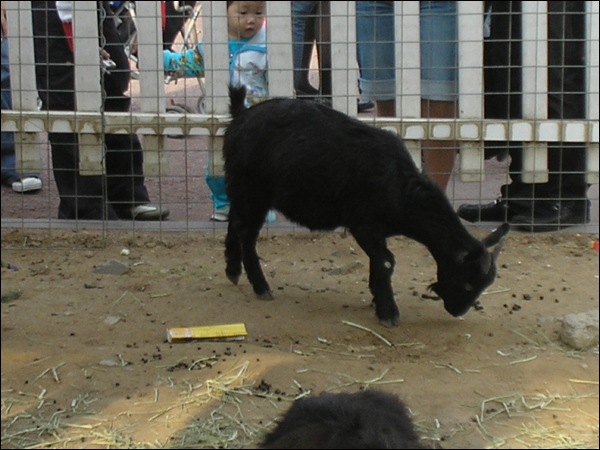 Examining a black goat at a petting zoo. Although Children's Day is a celebration of youth and innocence, its history has been marred by the politics of adults. In 1946 South Korea moved Children's Day from May 1 to May 5, but North Korea chose to celebrate International Children's Day on June 1, "a date that was established in November 1949 at the International Democratic Women's League Council held in Moscow." "The nation's flowers emerged from caves and broken buildings. Beside the budding, shrapnel-scarred elms along the streets, they watched. Now & then a youngster clapped or smiled, but mostly they stood with wooden faces, like tired old people who have found life very hard and who take little joy in parades." 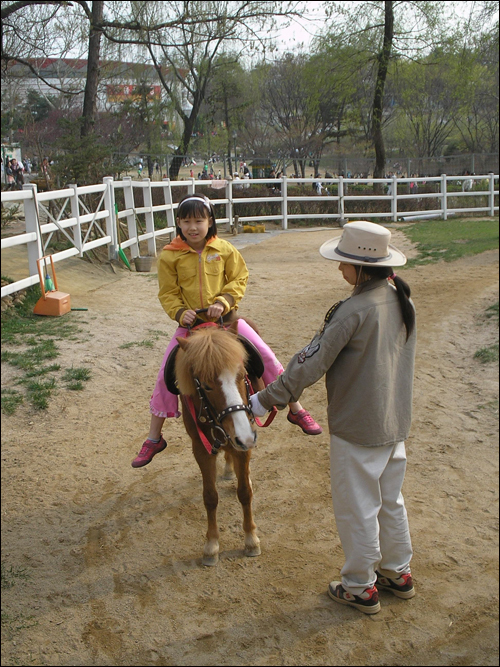 Little girl riding a pony. Fortunately things have changed since the war and children are now able to enjoy the bounty of living in a prosperous nation. 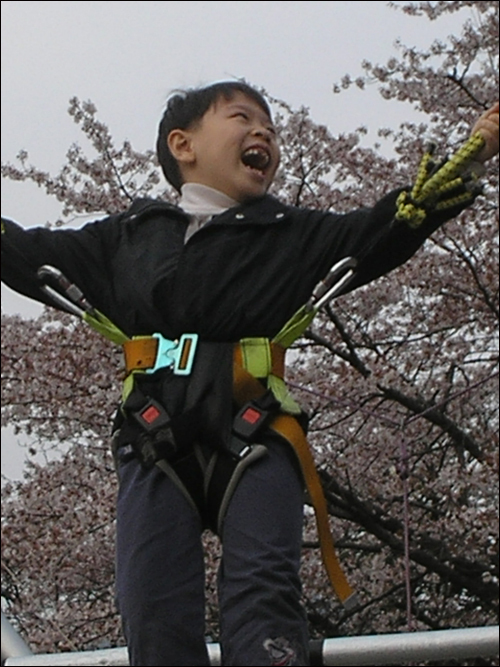 Parks, museums, and other venues of entertainment have been built for the benefit of children. One of the largest parks in Asia, the Seoul Grand Children's Park, was built under the guidance of then president Park Chung-hee who, echoing Bang Jeong-hwan, wrote: "Children are the heroes of tomorrow. May they grow to be gentle, vigorous, and wise." Let us hope. 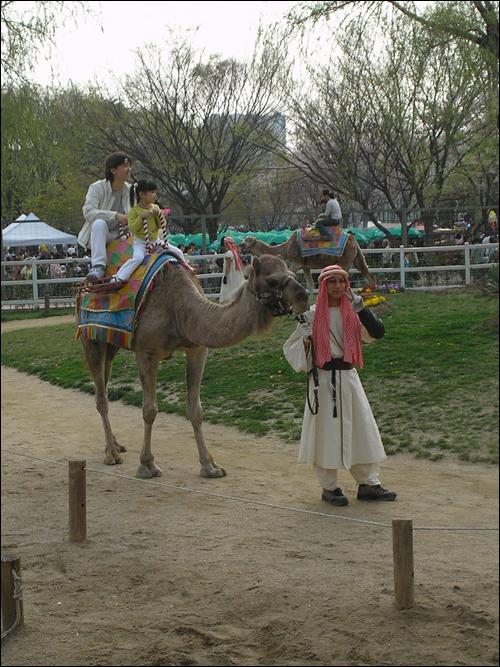 Riding a camel at Seoul Grand Children's Park.